Reliable satellite-based monitoring of forest cover requires Earth observation systems that have global, systematic acquisitions; free and accessible data; and high quality imagery – such as that offered by Landsat. Given Landsat’s global coverage, any methods are geographically portable and consist of standardized data inputs, mapping algorithms, and accuracy assessment protocols. The same generic approach may be applied for any geography or environment, at regional or national-scale, and for any dynamic change. Methods must be implemented in a timely and repeatable fashion and include accuracy assessments for generating valid area estimates. 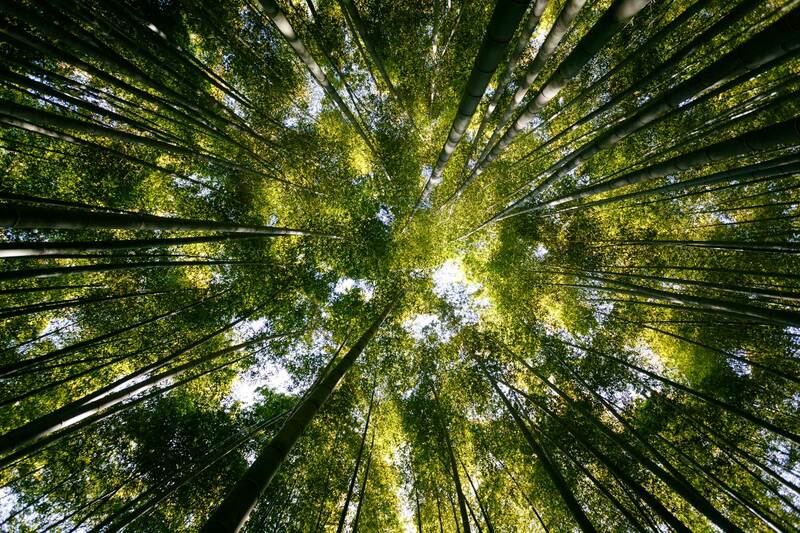 Four Indicators of sustainable forest management have been identified by the United Nations. To measure and monitor these Indicators, information beyond tree cover extent and change is required, for example: forest type, disturbance history, intactness, and land use allocation. Satellite time-series observations can be used to quantify several themes that contribute to sustainable forest management objectives, in conjunction with ancillary data that are required to fully assess the implications of satellite-derived trends in the extent of natural and managed forest cover. Landsat-derived image composites and metrics are generated globally as part of the Global Forest Watch initiative and by independent laboratories such as the University of Maryland’s Global Land Analysis and Discovery laboratory. The integration of Sentinel data into the forest characterization system is underway. National-scale data are subset from the global data and delivered to the respective national counterpart responsible for mapping and monitoring of forest resources. Pre-processed data are delivered to national agencies responsible for mapping and monitoring forest resources in the form of cloud-free Landsat time-series imagery. National analysts are trained on an ‘active learning’ approach using supervised classification data-mining algorithms to iteratively map forest cover extent and change for a defined baseline period. These data are used to establish reference data on emissions from deforestation, assess land use policies (protected area effectiveness), and improve transparency of national land resource information. Reference forest types, carbon stock strata, and post-clearing land use may be similarly mapped to bring added value to the generic forest cover analysis. Subsequent updates of the map are dependent only on the delivery of new image inputs. Upon completion of mapping, good practice accuracy assessments are performed in establishing definitive area estimates that can support Indicator 15.1.1. Forest cover extent, loss, and gain are the primary inputs to assessing intact, primary/long-lived forests and afforestation/reforestation. All intact and primary forest lands are monitored, and a reference state (forest type/carbon stock), change factor (logging/fire), and official land use (forestry/protected area) data are integrated with forest change data to report on 15.2.1. Attribution of changes may be mapped directly or assessed using sample-based methods. 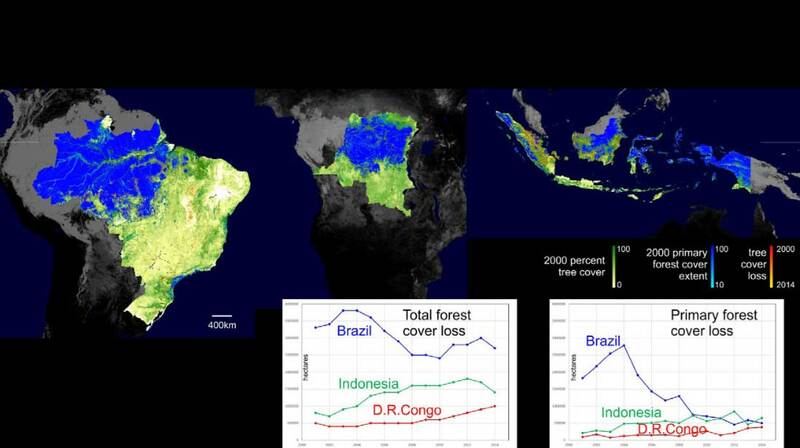 All-tree cover loss, and primary forest cover loss for Brazil; Democratic Republic of Congo; and Indonesia from 2001 to 2014. EO data can act as a source to help countries monitor, track, and report on Indicators 15.1.1 and 15.2.1, especially in cases where a strong forest inventory is absent. EO can also be used for validation purposes, and in conjunction with forest inventory data. National data are still needed to facilitate the analysis of satellite-based forest monitoring products and progress on sustainable forest management. Full accounting of forest dynamics requires accurate attribution of forest-change factors. Automated change-factor mapping methods are not yet mature, and image interpretation is often used to differentiate natural from human-induced disturbances. NASA and the University of Maryland have developed this methodology and are now in contact with the U.S. Forest Service and the Ministry of the Environment in Costa Rica, to identify ways to support the country-level monitoring and reporting process for 15.1.1 and 15.2.1. Additionally, the team is seeking supplemental candidate countries to test the method for SDG monitoring and reporting. The methods have already been implemented for a number of countries, including Peru, Colombia, Republic of Congo, Bangladesh, and Vietnam with current activities focused in Guatemala, Cameroon and Nepal. Peru has adopted the method and results for official reporting. Landsat-based estimates of canopy cover for trees that are taller than 5m for the U.S. Globally consistent processing of input Landsat data enables large area (national-regional-global) land cover mapping and monitoring. NASA, USGS, University of Maryland, College Park. Also, in contact with the Office of the Chief Statistician in the U.S., the U.S. Forest Service, the Ministry of the Environment in Costa Rica, as well as the National Administrative Department of Statistics (DANE) in Colombia.